The construction is very simple with no increasing or decreasing. Begin at the bottom, working hdc in the round. 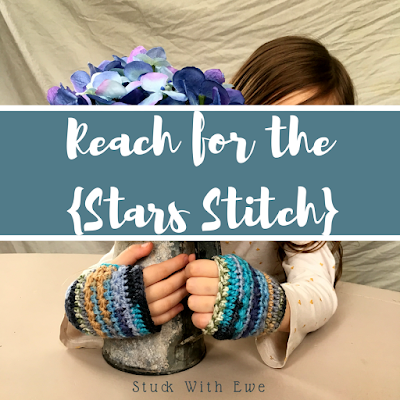 Then, switch to working star stitch in rows (which creates the thumb slit) and then go back to rounds of hdc to close off the top. They're reversible, made in one piece, and easy enough to whip up in one or two evenings. Don't have time to make them now? Add them to Ravelry HERE. Not on Ravelry? Add them to Pinterest HERE. 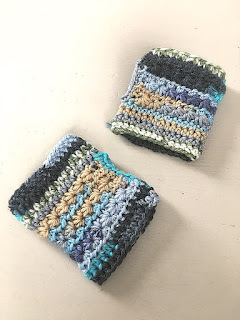 Each Hdc row begins with a ch 1, which does NOT count as a stitch. Make sure it's fairly loose, or the ends of your rows/rnds might slope downward a little. 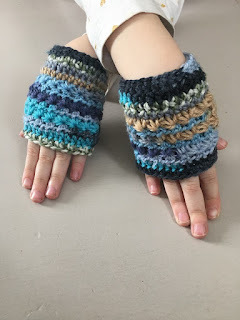 The stitch multiple is 2 (excluding turning chs) so to make these in a different size, begin with any multiple of 2, plus your turning ch. I began with foundation half double crochet (fhdc) instead of a chain but include an alternate first row that starts with a ch. Beg Star: Beginning Star. Ch 3. *Insert hook into second ch from hook, and pull up a loop. * Repeat in next chain. *Insert hook into next stitch, pull up a loop* Repeat 2 more times. 6 loops on hook. Yarn over, and pull through all six loops. Ch 1. (the ch 1 is the center of your star) Beg Star made. Star: Insert hook into center of previous star (the ch 1) and pull up a loop. Insert hook into the same stitch as last yarn over of prev. Star, and pull up a loop. Insert hook under last loop of prev. Star and pull up a loop. * insert hook into next stitch, and pull up a loop. * Repeat again. 6 loops on hook. Ch 1 (center made). Star made. A note about star stitches: The beg star is worked across 2 ch and 3 hdc. Every other star is worked over 2 hdc. For a more in-depth explainations (and photos), check out THIS tutorial. Round 3-4: Repeat round 2. Now switch to working in rows. Round 12: Ch 1, hdc in each st, join with a sl st to 1st hdc. 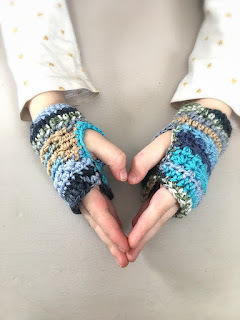 Thumbhole edging: Join yarn to any space in thumb opening. Sc evenly around. Fasten off. Weave in all ends and rock your new mitts! If you like what you saw, like Stuck with Ewe on Facebook, check out my Ravelry pattern page, and leave me a comment below.